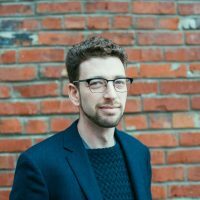 Michael Schwartz is Director of Community Engagement at the Jewish Museum and Archives of BC. Over the past four years in this role, Michael has increased the visibility of the JMABC through innovative public programming including The Chosen Food Supper Club, The Kitchen Stories podcast, seven online exhibits, and collaborations with organizations including Capture Photography Festival, the Contemporary Art Gallery, and the HUA Foundation. Michael is a member of the board of the Heritage Vancouver Society.